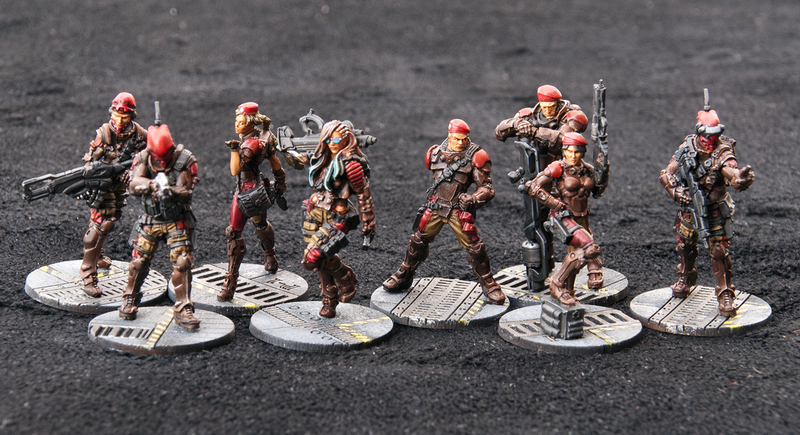 The most recent Mayacast masterglass requirement was a "Named Character" - So I decided I had to finally paint up McMurrough for my Nomads. I had debated how I was going to do his armour for a while, before I decided to go just dark, to call more attention to his kilt and face. The skin (fur?) colours were decided by me wanting him to be red-ish, and still skin-ish. I figured a dark grey almost-black would allow those to stand out more, and would believably be an armour colour he'd have as a default. I figured it'd be odd for him to have white, and equally weird for it to be camouflaged, since he gains no benefit from camouflage. The fur was airbrushed with Vallejo Light Rust (71 129) before being washed with sepia, highlighted with Iraqi Sand. The more skin bits of his face, hands, and feet were midtone flesh. The symbol on his shoulder is a simplified version of his infinity army profile symbol. 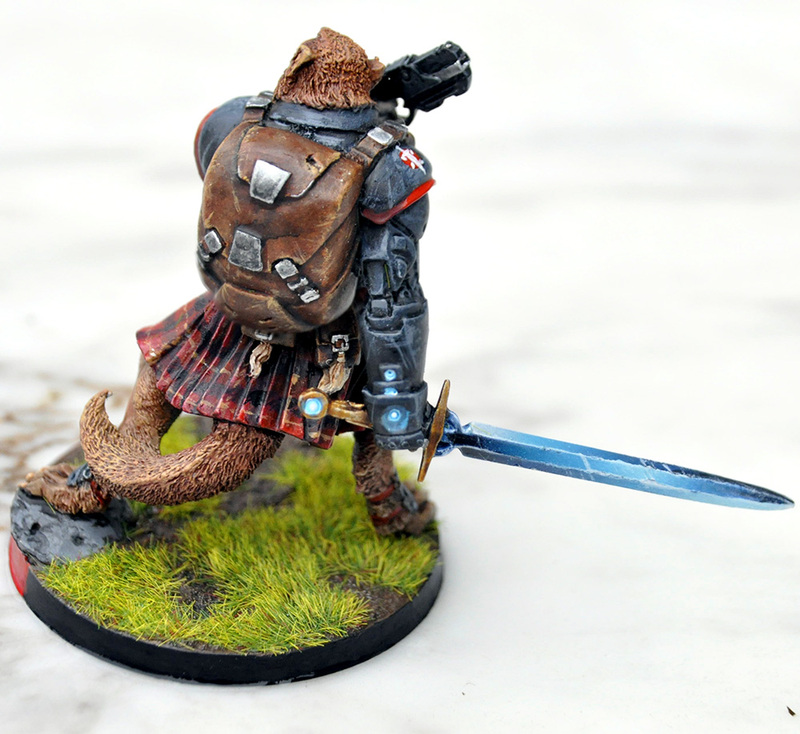 The tartan was airbrushed with dark-red to bright-red, having masked off the rest of his fur. 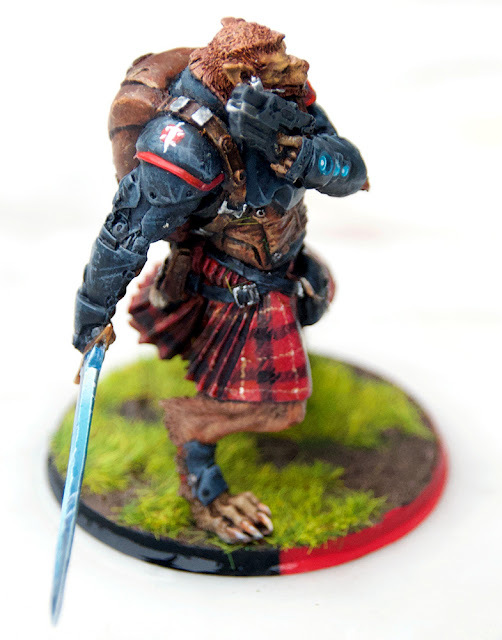 After I painted the reds, I struggled a bit with how to make his tartan look like woven fabric. First I did hatch-style highlighting on the red, and then tried it on the bands. 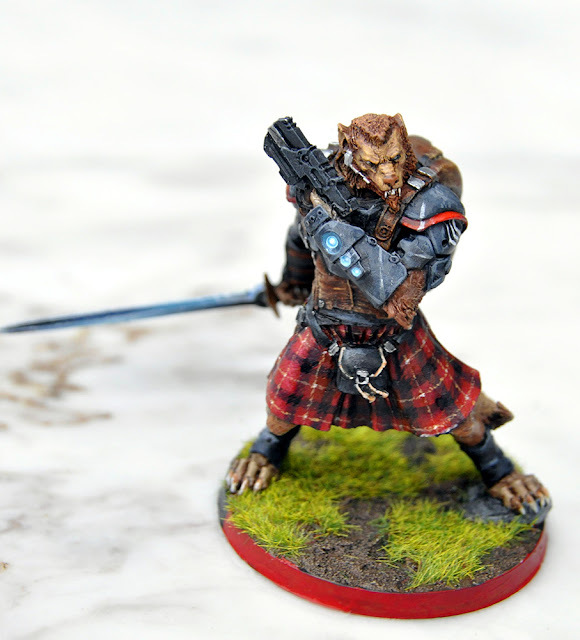 I gave up after a few attempts, painted solid bands, and then 'worried' the edges of the bands with the red of the undertone kilt to get the effect. Crossovers between two sections of tartan were done in solid black, hatch-painted to give it a rough-edge vibe. The final thin band is fleshtone lightly dotted for the main lines, before being dotted with a bleached bone colour where two lines would meet. The sword was my first real attempt at masked airbrush metallics, since it's supposed to be a crazy sci-fi sword. The colours are all Vallejo, from pure black through default blue, a bright cyan and white. I went back and added white scratches, light glints, and worry-marks, since his blade has not been upkept properly! The same colours are on his gauntlet tech, and the sword's hilt. I kept his armour markings to a minimum, since he's a mercenary. But now to the fun stuff alluded to in the title; I had a hard time picking out a tartan because I couldn't find a Scottish clan named McMurrough: Turns out that's because McMurrough is an Irish family name! That suggests that our boy here has a very interesting history. His first name, "Tearlach" is a Scottish Gaelic version of "Charles", "Dearg" is Gaelic for "Red", and McMurrough is Irish. Even his clan slogan, or personal slogan, "Buaidh No Bas" is an Irish/Scottish clan motto for "Victory or Death"! So what does that mean? Well, if his last name is Irish, it means he wouldn't have a family/clan tartan. Irish tartans are based on county or region. 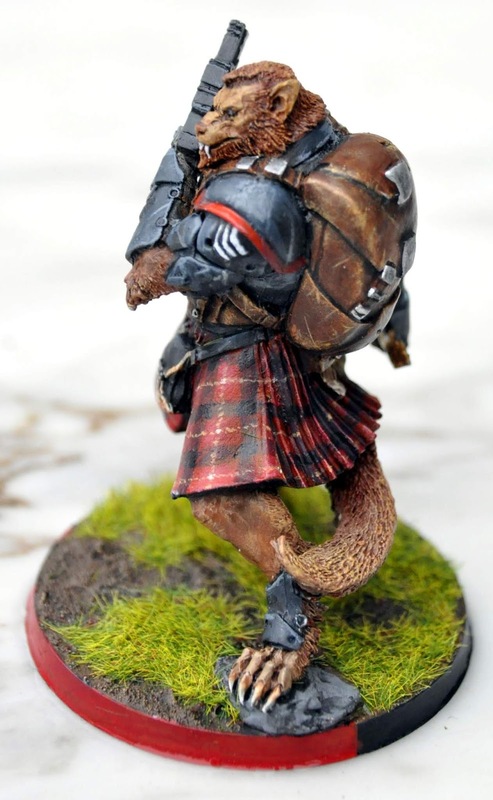 So in this case, working as he is for Corregidor, he wears a kilt with primarily red, with black and white highlights in honour of his clients/patrons, the Corregidorans! I love playing with McMurrough. Win or lose, he's almost guaranteed to do something epic, and the look on an opponent's face if he succeeds, and rampages across half an army alone is worth the effort! An entire Druze force, and I tried to make it not look like any force that already exists. Green is already taken by Ariadna (and to a lesser extent by Haqqislam). I thought about what colour is not taken by any army, and brown came to mind. Supported by Red, because that'd look cool. Hilariously I later realized that also makes it look like the Browncoats from Firefly! The labeled picture! A link team of 5 to the left with a few proxies (notably the brawler doctor from Bipandra, and Valeria Gromoz as played by the Druze limited hacker. On the right is the Brawler Haris, with a Heavy Rocket Launcher, the Haris leader, and the spec ops as Doctor. Back view. 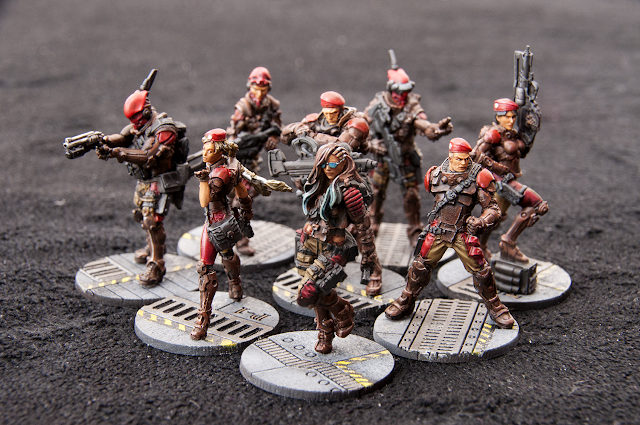 The bases are custom-made by me on a laser etcher: I wanted to get a different feel than my typical transparent bases, and especially with how many of the models have very thin connection points, it would make it easier to lock the models in place! Hope you like it, next time I try to find more of my "oh yeah, I did take photos of this" stuff!